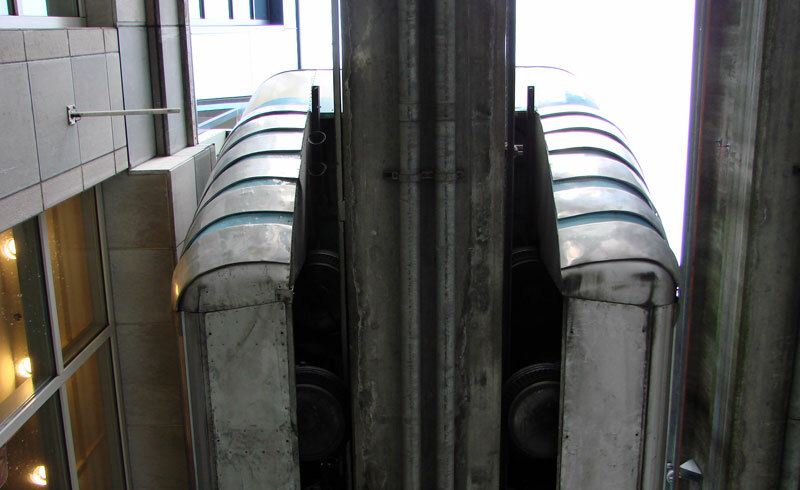 The last time we visited the Seattle Center Monorail was in August of 2001 (Seattle Center Monorail 2001 - Photo Essay). Much has happened since then and the time is right for an update. 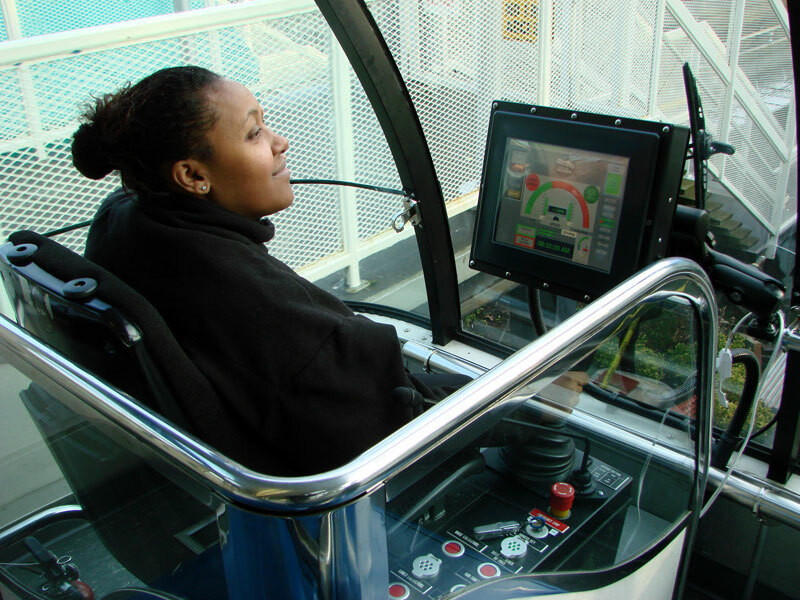 In late 2009, TMS President Kim Pedersen was contacted Russell Noe', Seattle Center Monorail's Maintenance Manager. Russ told Kim about the major rehabilitation the system was undergoing, and made an offer that could not be refused. A trip was in order. What follows is a photo essay of that trip, along with Russ's and Kim's comments. Kim: Welcome to Westlake Center, Seattle, Washington. The Blue Train is seen hugging the wall of Westlake Center. The Seattle Center Monorail, despite only two stations and .9-miles of track, carries approximately 1.5 million passengers every year. Russ: This photo shows Westlake Station. Directly below this station in the tunnel is the new LINK light rail, now connecting to Seattle-Tacoma (SeaTac) International Airport. Kim: Looking straight up at the classic ALWEG-built Blue Train at Westlake. Look closely and you can see the horns to the left of the beam. Russ: The discs under the Guide (side) Tires are the run-flat devices: rubber-lined steel discs that prevent excessive deflection in case of flat tires. Kim: A quick elevator ride (or escalator) and were ready to board. During the quiet times of the day, tickets are purchased on board the trains. 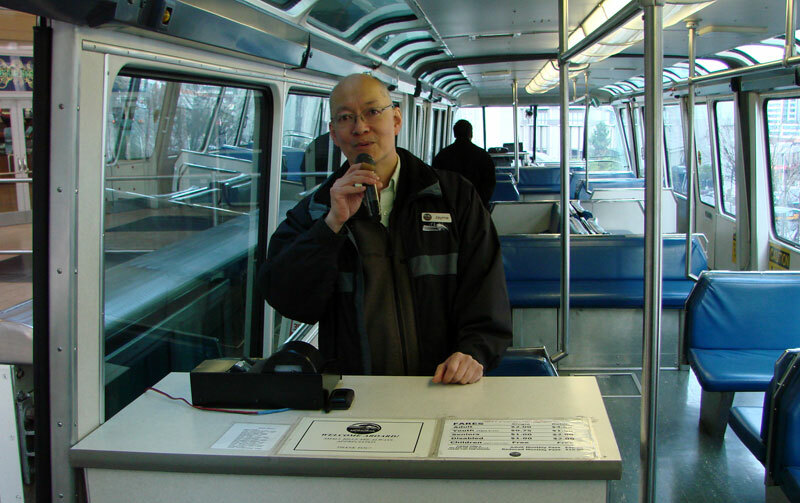 Jayme Gustilo, who has worked at the Seattle Center Monorail for 20 years, greets passengers and makes announcements with a very friendly personality. 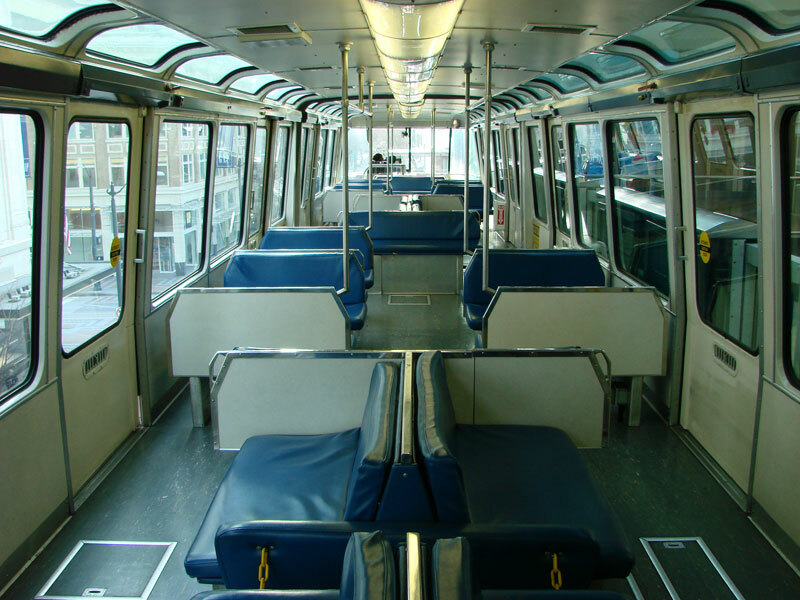 Russ: The Seattle Center Monorail takes great pride in being friendly and customer oriented. Kim: Before we head out towards Seattle Center, take a look at the beautifully restored interior of the Blue Train. Russ: Blue Train is fully rebuilt and has been operating in revenue service since March 2009, after several months trouble-shooting the new systems. The following items were stripped, refurbished, replaced: All traction system bearings, bushings, drive shafts, U-joints, load spindles (new ones cast and machined), the entire pneumatic and brake system redesigned and replaced, same for the low Voltage system, including installation of 16 Programmed Logic Controllers (PLCs). Entirely new unitized air compressor systems were also designed, fabricated, and installed. Kim: There is that infamous and unnecessary pinched track, which resulted in the scary Seattle Scrunch if 2005. 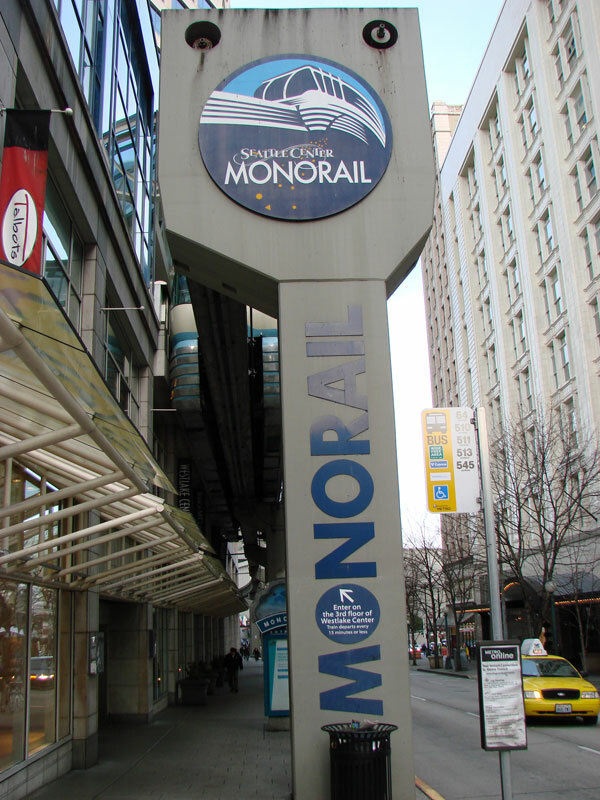 I understand Seattle Monorail Services, which holds the concession with the City of Seattle to manage and operate the monorail, has suggested rebuilding the station, both before and after the accident. Heres hoping that track will be split again for safety reasons, as well as for increased system capacity. Kim: Heres a nice look at the new driver station of the Blue Train. Our driver for this run is Sarah Yohannes. Russ: The original drivers' stations (trolley-controller vintage) were removed and replaced with modern joy-stick controllers and touch-panel displays. Our biggest challenge was getting the new control system to work correctly with the original 1961 G.E. Control Packages and DC traction motor system. The Drivers give the new operating cabs an A+ for ease of use and effectiveness. 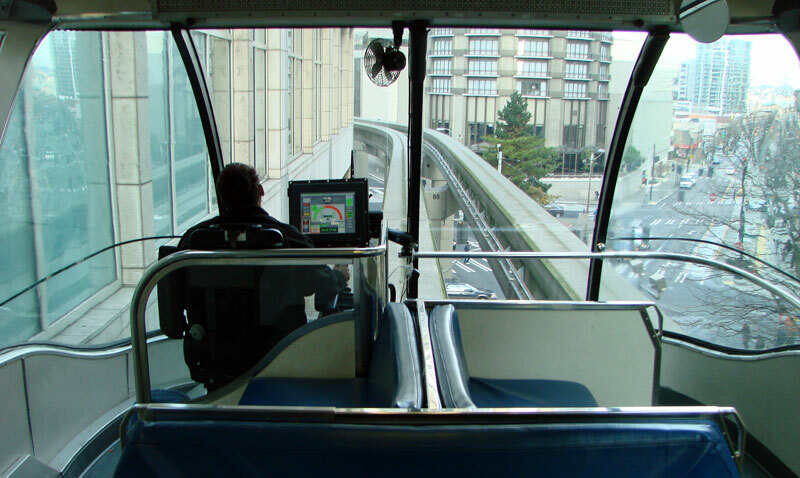 Kim: The Century 21 monorail now has a touch screen from Century 21. Russ: This shows the display as the trains are sitting in the Seattle Center Station. 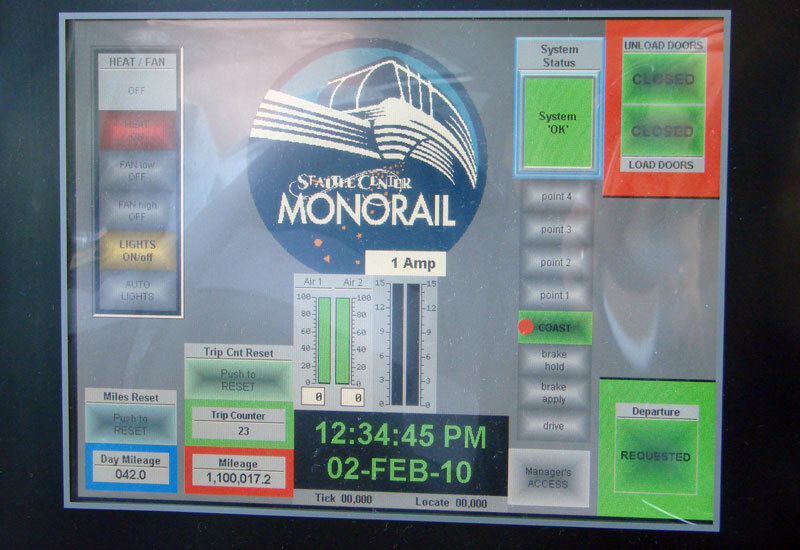 The touch-screen buttons provide intuitive operation of the Trains.